Water Street Home Planting More Trees? Yes, Please! Welcome to autumn, which is harvest time and apple picking season! Over the last few weeks, I’m sure that apple pies, cakes and cobblers have made their way into your homes. Sure, orchards are fun places to pick apples that you can later use to make delicious desserts, but what you may not realize is the crucial role that trees play in our communities and the environment. Since water is such a critical aspect in helping these trees grow, the American Water Charitable Foundation decided to partner with the Fruit Tree Planting Foundation to plant fruit tree orchards in ten cities throughout the U.S. Together they’ve planted trees among different schools and communities, already visiting Illinois, Kentucky, West Virginia and New Jersey. Both organizations have a mission of fostering vibrant and healthy neighborhoods. And all of this is being done without the use of pesticides, which also helps the environment. Trees in general make communities healthier and greener in many ways, and fruit trees are even better because of their edible produce! But without water, none of this would be possible. Fruit tree orchards need reliable water services to nutritiously grow and benefit the community and the environment. Trees clean the air. 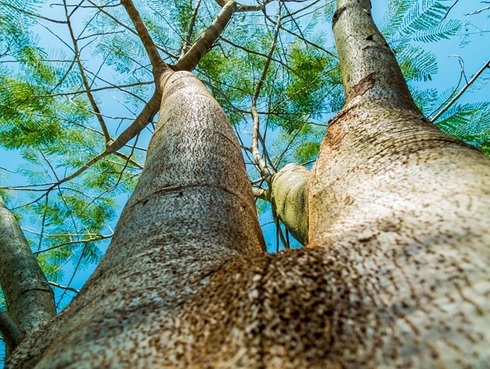 Trees absorb odors and pollutant gases such as carbon dioxide, nitrogen oxides, ammonia, sulfur dioxide and ozone by trapping them in the trees’ leaves and bark. Trees provide oxygen. In one year, an acre of mature trees can provide enough oxygen for 18 people. The minimum size of an orchard is about 10 acres, and the average size of a U.S. orchard is about 50 acres! Trees clean and save water. When it rains, water flows down the trunk of a tree. The trunk acts as a filter and removes pollutants, and clean water is absorbed into the earth below. The shade from trees saves water by slowing water evaporation from thirsty lawns. Trees help prevent soil erosion. Trees can slow runoffs and hold soil in place, especially on hillsides. While water itself is a critical resource in our daily lives, so are trees and all the benefits that come with them. I’m proud to say that we’re contributing to supplying both resources, which go hand in hand. Yet again, water contributes positively to our lives.